The present invention pertains to a six compound pharmaceutical formulation and its process of making comprising of antituberculosis agents like Rifampicin, Isoniazid, Pyrazinamide, and Ethambutal with addition of antioxidants such as d-alpha tocopherol or tocopheryl acetate and pharmaceutically accepted salts thereof and ascorbic acid in required therapeutic quantities for use in treatment of tuberculosis in mammals. This six drug formulation shows synergistic mycobactericidal activity coming along with reduction in oxidative stress, leading to reduction in lung cell damages. The present invention further demonstrates mycobactericidal activity of antioxidants such as d-alpha tocopherol and tocopheryl acetate. The present invention is an improvement in drug formulations used for treatment of tuberculosis. The said improvement is achieved by addition of antioxidants. This improved formulation is for use in the treatment of tuberculosis and shows a synergistic activity. It is new and novel formulation combining antioxidants with antituberculosis agents. Background art: Mycobacterium tuberculosis bacilli (MTB) are the most common causative organism for tuberculosis, (TB) in human. Estimated around one quarter to one half of world's population is infected by these organisms and cause world wide death, of some 3 million people each year. Studies before the-advent of chemotherapy showed that untreated tuberculosis is often fatal. One third of patients died within 1 year after diagnosis and one half within 5 years. Of the survivors after 5 years, 60% had undergone spontaneous remission whereas remaining 40% still continued to suffer and excrete tubercle bacilli. With the advent of chemotherapeutic agents effective against mycobacteria and the experience over past years from the use of various agents alone or in combination for treatment of tuberculosis in humans as well as animals has resulted in formulation of various treatment regimes. The aims and objective sub served by various treatment regimes are one to make a open case (which shows presence tubercle bacilli in sputum) of pulmonary tuberculosis a closed case (no tubercle bacilli are seen in sputum), so as to stop further transmission and spread of disease to other members of society by way of droplet airborne spread, two to cure the affected individual of the disease, by using drugs in various combinations which either inhibit growth of mycobacteria or kill the mycobacteria, three to prevent emergence of multi drug resistant mycobacteria. This objective is achieved by using multiple drugs concurrently. These drugs are used either as separate dosage form or as a combination formulation in a single dose preparation. Directly observed therapy (DOT) has further helped in reducing, multi drug resistant mycobacteria by reducing chances of interrupted drug therapy and noncompliance. The recommended regimes are, in large part, based on evidence from clinical trials and are rated on the basis of a system developed by the United States Public Health Service (USPHS) and the Infectious Diseases Society of America (I DSA). There are four recommended regimes for treating patients with tuberculosis caused by drug-susceptible organisms. Although these regimes are broadly applicable, there are modifications that should be made under specified circumstances, described subsequently. Each regime has an initial phase of 2 months followed by a choice of several options for the continuation phase of either 4 or 7 months. The general approach to management is summarized as follows Two drug regime-Rifampin and Isoniazid Three drug regime-Rifampin, Isoniazid and Ethambutal Four drug regime-Rifampin, Isoniazid, Ethambutal, Pyrizinamide and/or streptomycin. Because of the relatively high proportion of adult hosts with tuberculosis caused by organisms that are resistant to isoniazid, four drugs are necessary in the initial phase for the 6- month regime to be maximally effective. Thus, in most circumstances, the treatment regime for all adults with previously untreated tuberculosis should consist of a 2-month initial phase of Isoniazid (INH), Rifampin (RIF), Pyrizinamide (PZA), and Ethambutal (EMB). The initial phase should consist of INH, RIF, PZA and EMB given daily for 2 months. Examples of circumstances in which PZA may be withheld include severe liver disease, gout, and, perhaps, pregnancy. EMB should be included in the initial phase of regime until drug susceptibility is determined. The first-line antituberculosis medications should be administered concomitantly ; split dosing should be avoided. Fixed-dose combination preparations have advantage of case of administration over single drug preparations and are shown to decrease the risk of acquired drug. resistance and medication errors. Fixed-dose combination formulations can be used when. directly observed therapy (DOT) is given daily and are especially useful when direct ! y observr : d therapy (DOT) is not possible. Most of the drug combinations are Kits containEng three or four individual drug preparations packed together in a single foil. A range of dose of these first line antituberculosis agents administered are, Rifampin 450 mg, INH 300 mg to 600mg. Ethambutal 600 mg to 800mg, and Pyrizinamide 1200mg to 1500mg. Second line drug regimes comprising of drugs other than first iine drugs which are reserved for treatment of multi drug resistant cases i. e. those cases where the mycobactesia show resistance to the effect of one or more drugs used in. first line treatment regimes. The following agents are reserved as second line antituberculosis agents such as amikacin, aminosalicylic acid, amoxicillin/davulinic acid, azithromycin, capreomycin, ciprofloxacin, clarithromycin, clofazimine, cycloserine, ethionamide, kanamycin, norfloxacin, ofloxacin, rifabutin, streptomycin, thiacetazone. One of the potent chain breaking antioxidant has 6-chromanol ring structure with a phytol side chain referred more generally as tocopherol and the other as tocotrienols having double bonds in the phytol side chain at 3', 7', and 11'positions. These tocopherols and tocotrienois are present in various natural substances like wheat germ oil, soybean oil, and rice bran oil. Naturally occurring 6-chromanol ring compounds are a group of four tocopherols i. e. alpha, beta, gamma & delta tocopherols and four tocotrienols i. e. alpha, beta, gamma & delta stereo isomers, all of which are lipid soluble. A major part of the nutritive or therapeutic value of these 6-chromanol ring compounds in humans appears to be related to its properties as an antioxidant. In acting as an antioxidant, these agents, presumably prevent oxidation of essential cellular constituents, or prevents the formation of toxic oxidation products such as peroxidation products formed from unsaturated fatty acids that have been detected in its absence suggested that tocopherols function as a repressor that regulates the synthesis of specific proteins & enzymes required in differentiation or adaptation of tissues. 6-chromanol ring derivatives are chain breaking antioxidants and are efficient peroxy radical scavenger, which protects polyunsaturated fats in cell membranes from oxidation. These compounds also inhibit prostaglandin synthesis and activities of protein kinase C and phospholipase A2 These compounds are available in the form of capsules, emulsion, injections. Ascorbic acid a water soluble antioxidant is also known to be useful in treatment of scurvy, idiopathic methaemoglobinimea, in high doses to prevent viral respiratory infection and in cancer patient. It acts synergistically as antioxidant with other antioxidant agents. It is a water soluble substance having antioxidant, antiseptic and preservative properties. It is available in market in tablets and injection forms. Ascorbic acid may also modulate the immune system via its role in the regulation of hormones associated with stress. There is evidence that in many diseases of respiratory system like asthma, chronic obstructive pulmonary disease, lung cancer, there is increase in free radical generation and hence increased oxidative stress. Increased oxidative stress and raised levels of free radicals are known to damage and injure cell wall of bacterial as well human cells leading to cell death. Mycobacterium tuberculosis due to its specialized cell wall structure along with presence of abundant catalase enzyme which can destroy free radicals is protected from injury, due to raised free radical levels, in host whereas host cell membrane remains susceptible to such damages. All known antimycobacterial agents either kill or inhibit growth of mycobacteria. None of antimycobacterial agents have antioxidant properties. On the contrary one of the most commonly used antimycobacterial agent isonicotinic acid hydrazide is shown to be pro oxidant. Disclosure of invention: The object of present invention is to find status of oxidative stress, in tuberculosis patients and whether addition of antioxidants, in sufficient amount, and administration of these for sufficient duration of time, results in potential benefits in the outcome of treatment of tuberculosis in terms of better improvement in patients. Based on these findings, further investigations were undertaken to find out the mechanism, for such improvements and the possibility of evolving a process of combining these antioxidants with antituberculosis agents in a single unit dose formulation. The present invention relates on one hand, to the use of antioxidant, such as all-rac- alpha tocopherol and/or RRR-alpha-tocopherol and pharmaceutical acceptable salts or derivatives thereof as agents having a mycobactericidal property, which is a new action, useful. in the treatment of tuberculosis, and on the other hand a process for formulation of a new drug combination for use in the treatment of tuberculosis incorporating, some antituberculosis agents along with antioxidants, in a single dosage compound powder formulation. The combined formulation has synergistic, antimycobacteriai action and at the same time cause reduction in the oxidative stress leading to decreased host cell injury and damage. The present invention describes a new, and useful pharmaceutical formulation, comprising of first line antituberculosis agents such as rifampicin, isonicotinic acid hydrazide, ethambutol, and pyrizinamide and antioxidants such as all-rac-alpha tocopherol and/or RRR-alpha-tocopherol or pharmaceutical acceptable salts thereof and ascorbic acid, for use in the treatment of tuberculosis producing a synergistic effect in comparison with the use of above antituberculosis agents given together, without antioxidants. The present invention also further describes a new therapeutically useful mycobactericidal activity to derivatives and pharmaceutical acceptable salts used in therapy such as all-rac-alpha tocopherol, RRR-alpha-tocopherol. The present invention further describes a process for preparing a single dosage compound powder formulation containing these antimycobacterial substances and the antioxidants. The present invention further describes a new method or approach in the treatment of tuberculosis over the prior art by addition and use of antioxidants for prevention of lung tissue damage caused by liberated free radicals during the disease process and the course of treatment. The pharmaceutical formulation is intended for oral use. The following examples are included to demonstrate preferred embodiments of the present invention. For those of skill in the art, that the techniques disclosed in the examples which follow represent techniques to function well in the practice of invention and thus can be considered to constitute preferred modes for its practice. However those of skill in the art should, in the light of present disclosure, appreciate that many changes can be made in the specific embodiments which are disclosed and still obtain a like or similar result without departing from the spirit and scope of invention. Example1 : Newly diagnosed cases suffering from pulmonary tuberculosis were assessed for status of oxidative stress in comparison with the matching healthy volunteers by performing analysis of blood samples for lipid peroxidation levels using, Draper and Hadleys (1990), double heating method. Lipid peroxidation is used as marker of cell membrane damage. It was observed that the lipid peroxidation levels were raised in pulmonary tuberculosis patients significantly when compared with matching human healthy volunteers. This observation, suggest increase in free radical liberation and oxidative stress in patients of pulmonary tuberculosis. This observation provides a basis and rationale for an indication to use antioxidants. Example 2: About 100 newly diagnosed cases suffering from pulmonary tuberculosis demonstrating positive sputum smear, for acid fast bacilli (AFB), by Zeihl-Neelson staining procedure, and positive x-ray, lung involvement were included in the study. They were randomly divided in two groups. Control group received first line four drugs regime, comprising of Rifampicin 450 mg, isoniazid 300 mg, Pyrizinamide 1500mg, and Ethambutal 800mg, once daily by oral route for a period of two months. Study group received first line four drug regime as detailed above and two antioxidants d-alpha tocopherol in the dose of 400 IU, or tocopheryl acetate in the dose of 400mg and ascorbic acid in the dose of 500mg once daily by oral route for a period of two months. The outcome of clinical improvement was accessed by following parameters in every patient of both the groups and findings were compared and analyzed for statistical significance at the end of successful completion of treatment for two months. Sputum smear AFB staining test-In both the groups sputum of the the patients was analyzed for the presence of acid fast bacilli using standard Zeil-Nelson hot stain method at the end of 15 days, 30 days and 60 days. The reports were documented as positive for presence of bacilli and negative as absence of bacilli. The results of both the groups where compared at the end of 15 days, 30 days, and 60 days. At the end of 15 days treatment in study group 50 % patients showed sputum smear negative for acid fast bacilli as compared to 14 % in control group. A. similar pattern was observed at the end of 30 days treatment, 86% versus 50% and 100% versus 86 % at the end of 60 days treatment in study group versus. control group respectively. The study group showed much earlier and augmented sputum smear negativity for acid fast bacilli, suggesting a synergistic antimycobacterial effect, of the drug combination, used in study group. Lipid peroxidation levels (LPO)-Blood samples were collected from patients included in both the groups before the start of treatment but after confirmation of diagnosis of pulmonary tuberculosis and at the end successful completion of treatment of 60 days. The oxidative stress is indicated by lipid peroxidation was reported in terms of malondialdehyde (MDA) nmollgm of hemoglobin using Draper and Hadley (1990) double heating method. All the patients in study as well as control groups showed elevated LPO levels at the start of treatment. The LPO levels after 60 days showed significant reduction in study group patients receiving antioxidants along with four antituberculosis agents, indicating improvement in oxidative status. However in control group, patients showed a further rise in levels of LPO, indicating deterioration of oxidative status and confirming need for use of antioxidants for improvement in oxidative status and prevention of cell membrane injury and damage. Radiological investigations-Chest X-ray of all the patients from both groups was done at the start of treatment and after the completion of treatment of 60 days. The findings were visually analyzed and compared for each patient before and after the treatment. The findings were reported as favorable & improved or unfavorable and deteriorated. All the patients from study group showed favorable response as compared to 80% in control group suggesting a lesser damage to lungs in study group. Example 3 In vitro Studies-Lowenstein and Jensson (W) medium is used as a selective medium to grow mycobacteria and test sensitivity, to antimycobacterial agents. A set of (LJ) media was prepared by incorporating double dilutions of d-alpha tocopherol, and another set incorporating double dilutions of tocopheryl acetate yet another set without addition of any drug was prepared. These slopes were inoculated with known freshly cultured virulent strain of mycobacterium tuberculosis. Growth was observed at the end of each week for six weeks after incubating the media at 37 degrees for the entire period. A control medium slant without any drug was inoculated with same freshly prepared culture strain of mycobacterium tuberculosis. At the end of 6 weeks no growth was observed on (LJ) slopes containing the antioxidants like d-alpha tocopherol or Tocopheryl acetate in a concentration of 100 microgram per mi whereas the control slant showed a carpet growth. The above experiment was repeated with known strains available in laboratory showing resistance to one drug i. e. rifampicin or to two drugs i. e. rifampicin and isoniazide and at the end of 6 weeks it was observed that both these strain resistant to either rifampicin or rifampicin and isoniazid did not grow in (LJ) slopes containing antioxidants like d-alpha tocopherol or tocopheryl acetate in a concentration of 10U microgram per mi whereas the control slant showed a carpet growth. The results of in vitro studies have confirmed that both d-alpha tocopherol and tocopheryl acetate have mycobactericidal activity. The in vivo studies on patients of pulmonary tuberculosis also confirm these results based on the conspicuously enhanced sputum smear negativity for acid fast bacilli at the end of 15 days. From all the examples cited above it is confirmed that there is more oxidative stress in patients of pulmonary tuberculosis and a need for use of antioxidants to reduce cell membrane injury to the host cells. The above cited examples further prove that the d-alpha tocopherol and tocopheryl acetate have mycobactericidal activity and therefore can be used along with other antimycobacterial agents. The above cited examples further prove that such a use a combination of antimycobacterial agents and antioxidants referred in example is synergistic. Example 4: A known drawback of use of multiple drugs, is reduction in patient compliance i. e. failure to adhere to treatment protocol. This drawback is removed if multiple drugs are combined in single dosage formulation. 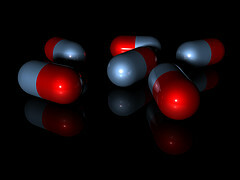 The inventors have further developed a process for pharmaceutical formulation wherein two to four required primary line antituberculosis agents in the therapeutical desirable quanta can be combined along with therapeutical desirable quanta of the antioxidants like d-alpha tocopherol or tocopheryl acetate optionally with therapeutically desired quantum of ascorbic acid in a compound powder unit dose formulation with the required additives, flavoring agents and suspending agents. The range of doses selected for individual agents per single unit dose preparation are as follows Rifampicin (3- [ (4-Methyl-l-piperazinyl) iminomethyl] rifamycin SV). 450mg powder Isonicotinic acid hydrazide (4-Pyridinecarboxylic acid hydrazide) 300 or 600mg powder Pyrizinamide (Pyrazine-2-carboxamide) 1200 or 1500mg powder Ethambutal (d-N, N'-bis (1-hydromethylpropyl) ethylene diamine; 600 or 800mg powder d-alpha tocopherol acetate-400 IU or 800 IU powder Or tocopheryl acetate--400 mg or 800 mg powder Ascorbic acid--125, or 250, or 500mg powder Saccharin as sweetening agent as per taste Flavoring agents-lemon, orange, anise, liquorice, raspberry as per choice. Permissible fillers and adsorbents in sufficient quantity This particular mixing of aforesaid substances was done by using mixture machines used in pharmaceutical manufacturing practice and the contents were homogeneously mixed so that the end product is free flowing powder. The prepared free flowing compound powder is further weighed into individual unit dose packs based on the total weight of individual agents added together required in the single unit dosage fixed dose preparation and sealed in appropriate air tight, light impervious sachet for further use.